Hey guys, It's Kara. I'm back with another PURE COLOR Combination. Summer is almost here and it's making me so happy! Today's card has a very summery color palette, bright sun and deep green grass. This warm color palette features Wild Mango, Falling Star, Flamingo, Mojito, and Appletini PURE COLOR dye inks. 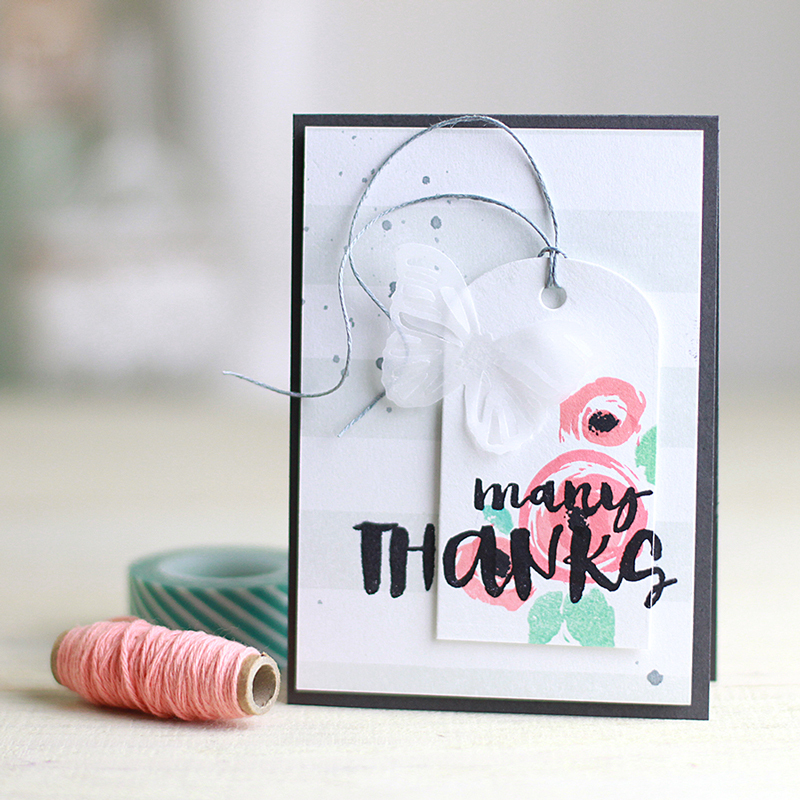 I started by stamping my design using Watercolored Anemones in Fairy Dust ink. 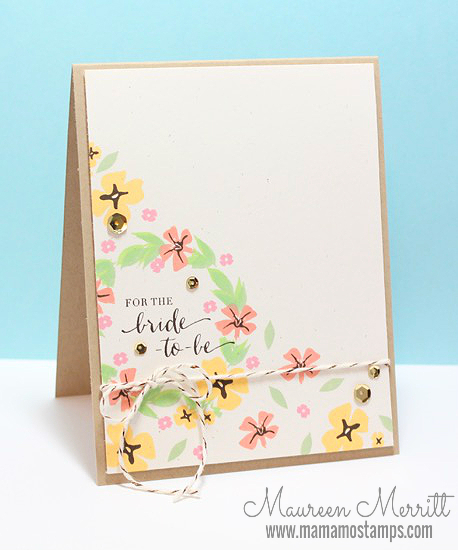 This pale grey serves as a guide for stamping the flowers and leaves in my color palette. It is soft enough to fade into the background while also providing a slight shadow for my images. I stamped the flowers in Falling Star, Wild Mango, and Flamingo ink. The leaves and stems are stamped in Mojito and Appletini ink. I used the new Black ink to stamp my sentiment from Doodle Buds. 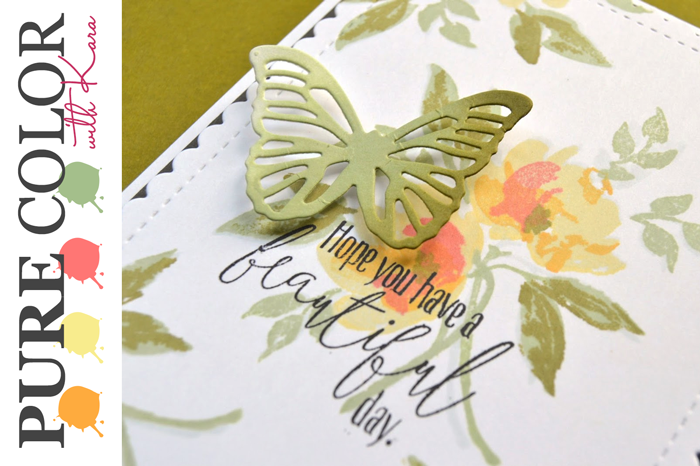 I die cut the butterfly from white cardstock. Using sponge daubers, I added color starting on one side with a little Appletini ink. As I moved across the butterfly to the left wing, I switched to Mojito ink and then let it fade to almost white. I mounted the stamped panel on a piece of Coal Mine cardstock to add some contrast and pick up the color from the sentiment. Coal Mine is perfect for this card because it is not as stark a contrast as black. What do you think, want to give it a go? We'd love to see your take on this color combination! If you'd like to play along link up your collections below to keep the inspiration going. Thanks so much for all of the participation in the last Throwback Thursday challenge. I just love seeing all of your beautiful creations. 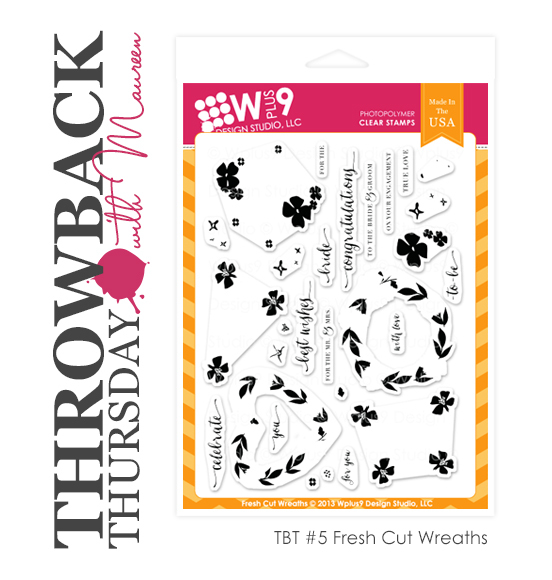 June makes me think of weddings so naturally the throwback set I'm using is Fresh Cut Wreaths. My designs this month will take you from the engagement to the wedding. For my engagement card I used the flowers from Fresh Cut Wreathes without the actual wreath. 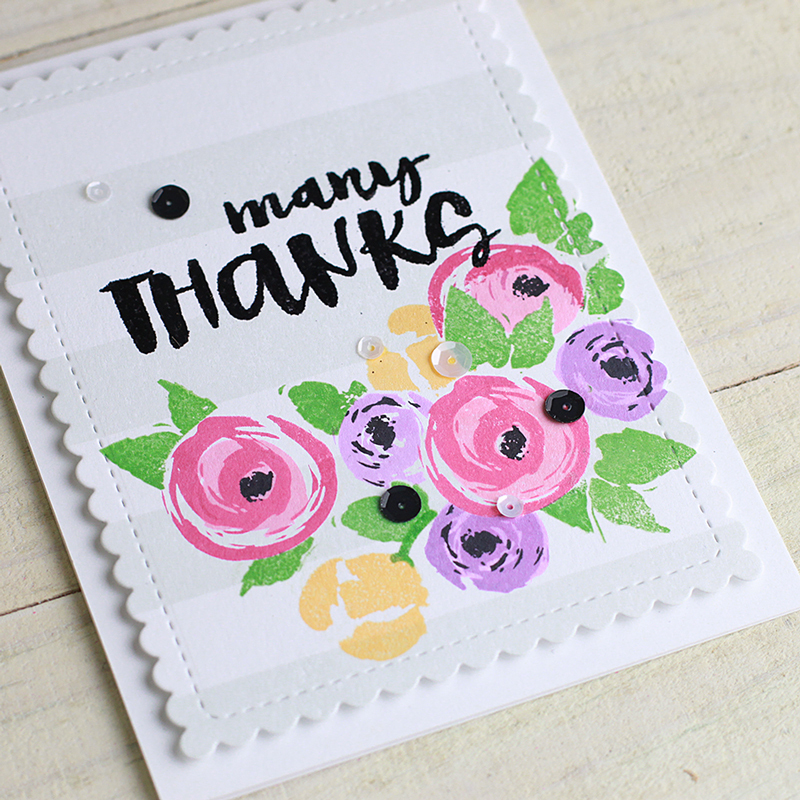 It made stamping the background quick and easy since I was laying down several flowers at once. 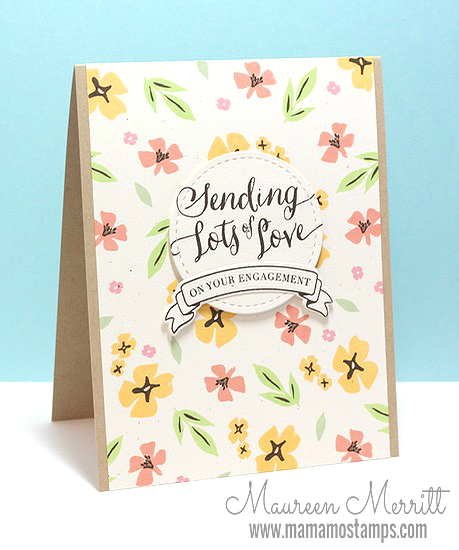 I borrowed some stamps from Valentine Wishes and Fresh Cut Florals to complete the design. For the Bridal Shower card I've literally showered the design with flowers. 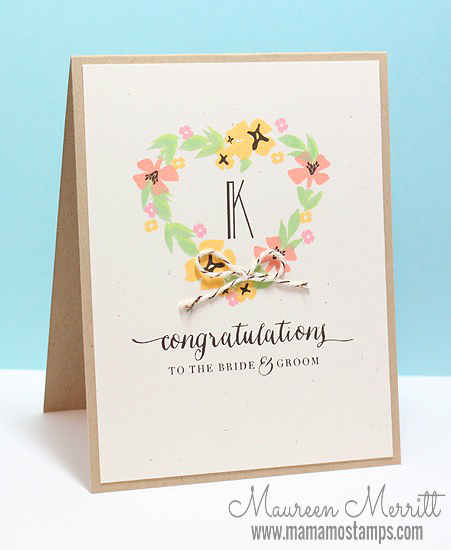 I stamped the wreath first and then inked up and stamped flowers as if they are floating across the card. I added a bit of twine to ground the sentiment and embellished the card with gold accents. 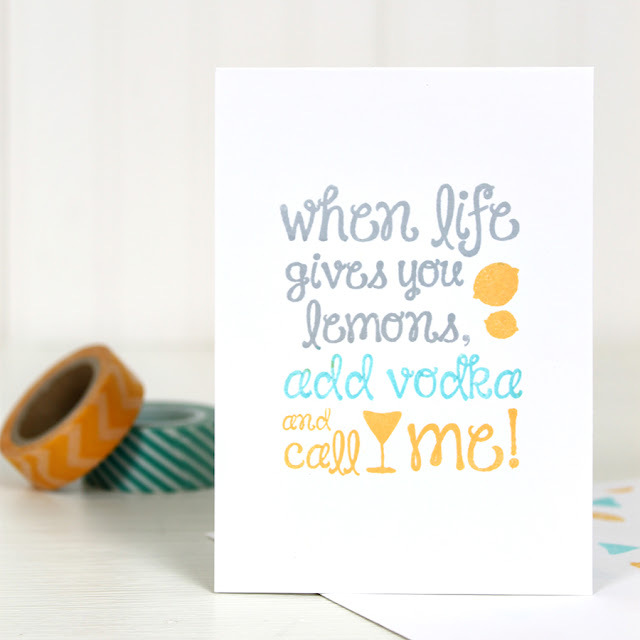 This card is perfect for any Summer or Spring Bridal Shower! The wedding card is the most traditional use of Fresh Cut Wreaths and also my favorite of the set. The monogrammed wreath is absolutely perfect for a wedding card and would make a nice gift set for either the shower or the wedding! Now it's your turn! We'd love to have you participate in our Throwback Thursday posts. 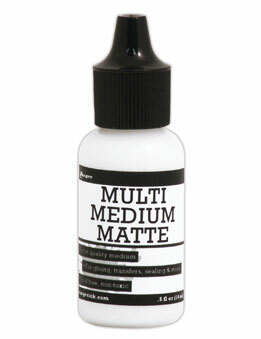 We know you've got some older product in your stash dying to see some ink! So let's pull em out. Use any card above as inspiration, or even the stamp set if you've got it, and let's see those "oldies but goodies" get some love! I just wanted to stop in quickly to say congratulations to Jennifer K! Jennifer was the winner from the Simon Says Stamp Blog Hop. Simon Says should have, or will be contacting you soon about your prize. 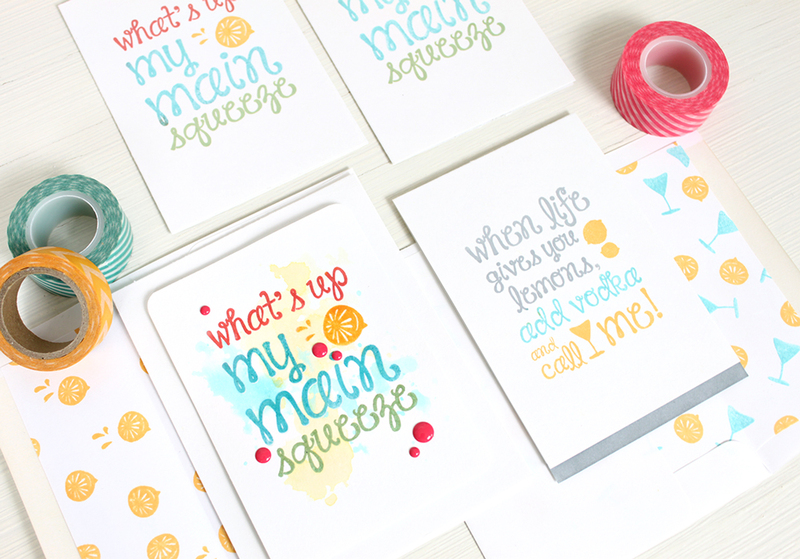 And while we are here, I thought I'd share a few more cards featuring products from our June 2015 Release. Sometimes you just need a card quick. Or you want to try a fun background technique. 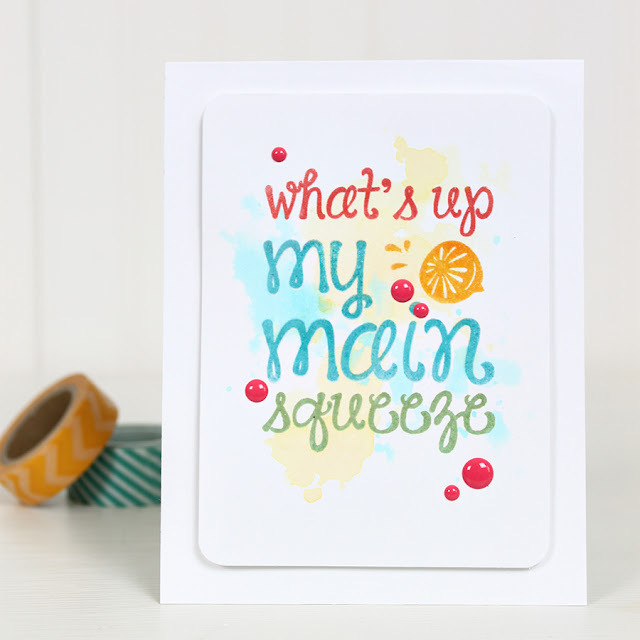 Big bold sentiments like our Main Squeeze stamp set are perfect for this. Simple designs with big impact. One of my favorite things to do with these kinds of stamps is selective inking. And thanks to the ingenious MISTI, it's easier than ever! I love the way these turned out and love how easy they were even more! Thanks for stopping by today. Be sure to come by again tomorrow as Maureen will have a new Throwback Thursday Challenge for you! Hello and welcome! I am very excited to be participating in the Simon Says Stamp The Color of Fun Blog Hop! Have you seen all of the new goodies that they just released? Fun, fun, fun! I had the pleasure of designing an exclusive stamp set for Simon Says Stamp! Heidi wanted something "very Wplus9". Which to me means, something out of left field. LOL But to most of you, I think it means florals. So here's what I came up with, and it was hard to hand this one over. This set is incredibly versatile. It is filled with roses in loose painted style. There are several sizes and each layer can be used alone or layered with others. There truly is no right or wrong way to stamp these! 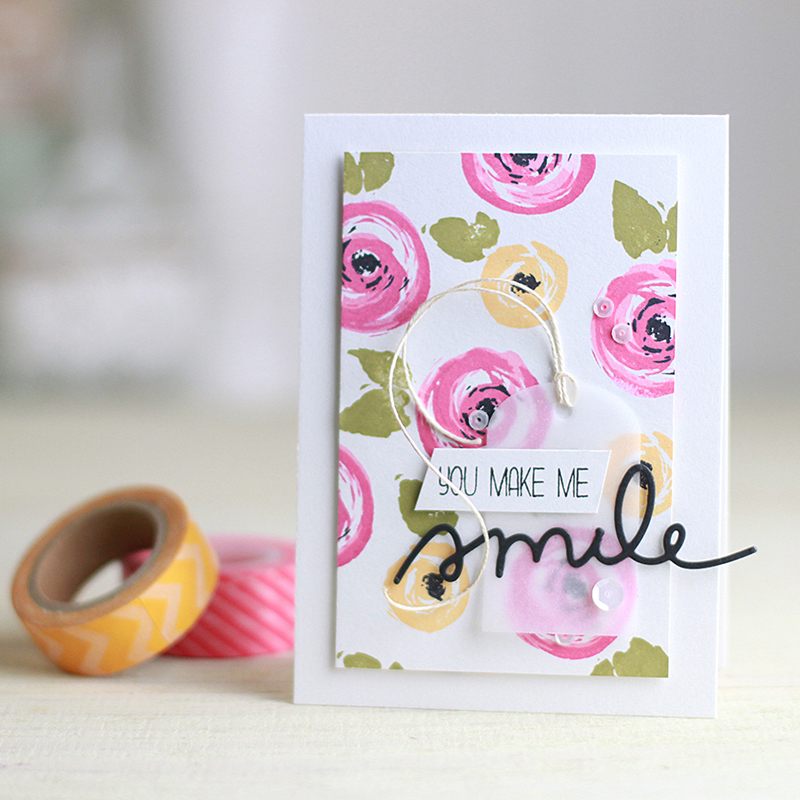 I've got a couple of samples to show you some of the different ways to use these blooms. Thanks to the range in size of the flowers, building up large bouquets is a snap. 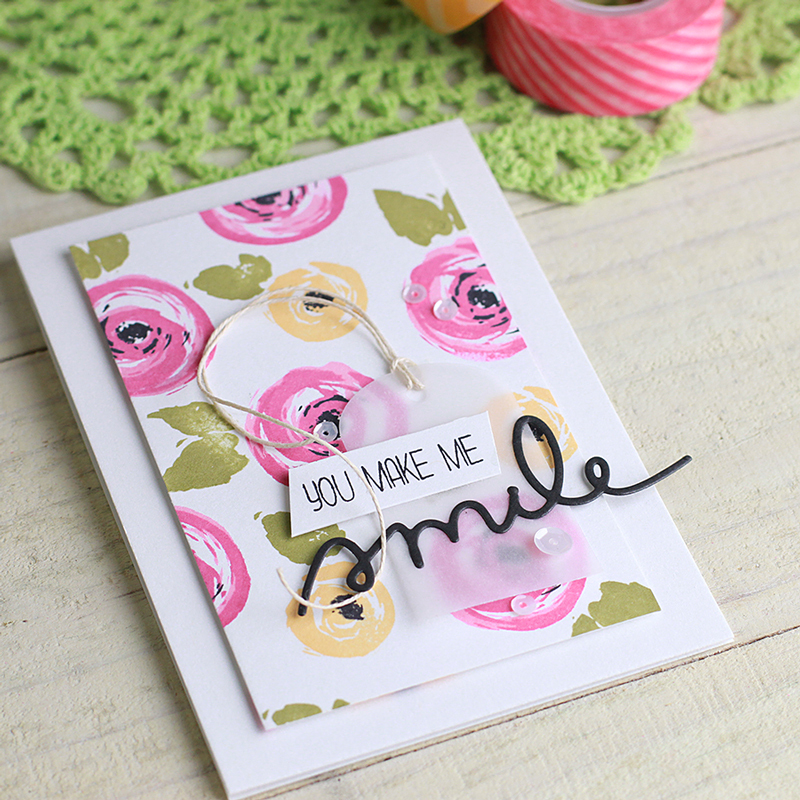 In this sample I've stamped each flower using a different set of layers. No two were created the same. 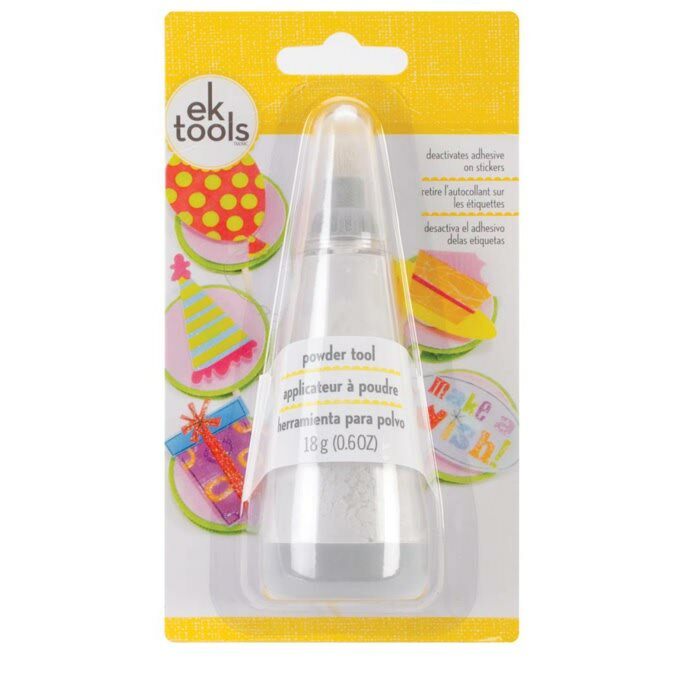 And of course, this stamp set is perfect for backgrounds and creating your own patterned paper. 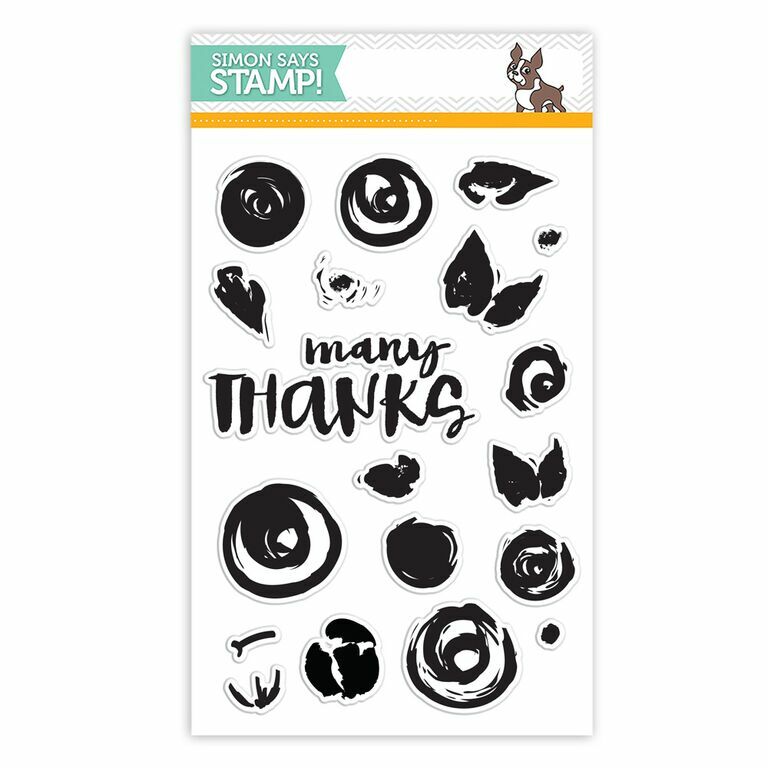 The large flower in this pattern was created by stamping one of the images in our Little Piggy ink and then rotating the stamp and stamping again in Sweet Gelato. I can't wait to play with this set more. I will be using it a lot even if just to add accents to CAS cards, like the one below. The flower at the top is one of my favorites, I just love how it is perfectly shaped to look like it is tucked behind another flower, no masking necessary. 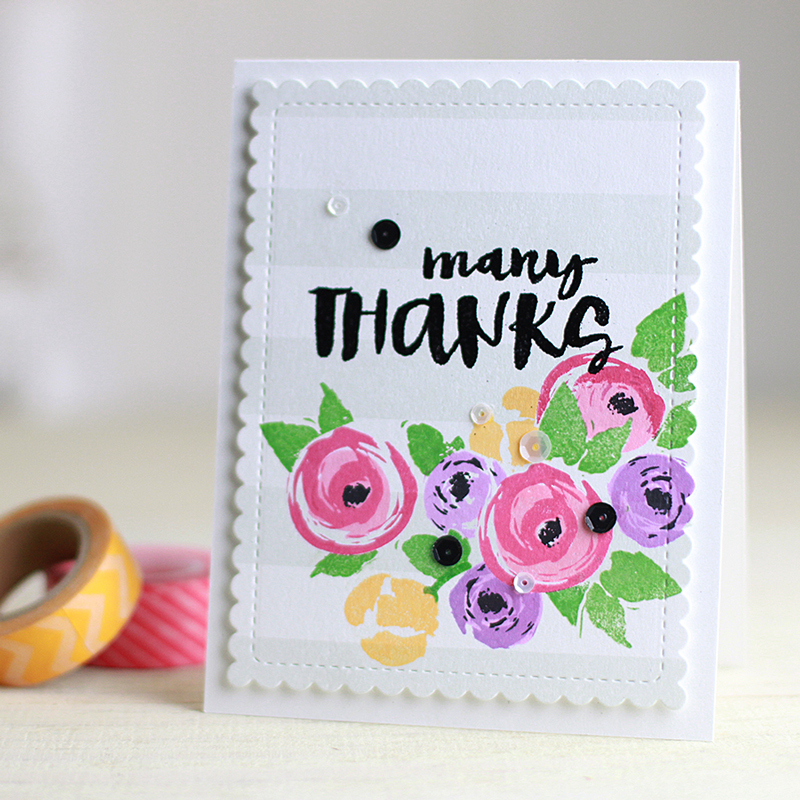 I hope you've enjoyed today's projects and that you'll love the Many Thanks stamp set as much as I do! 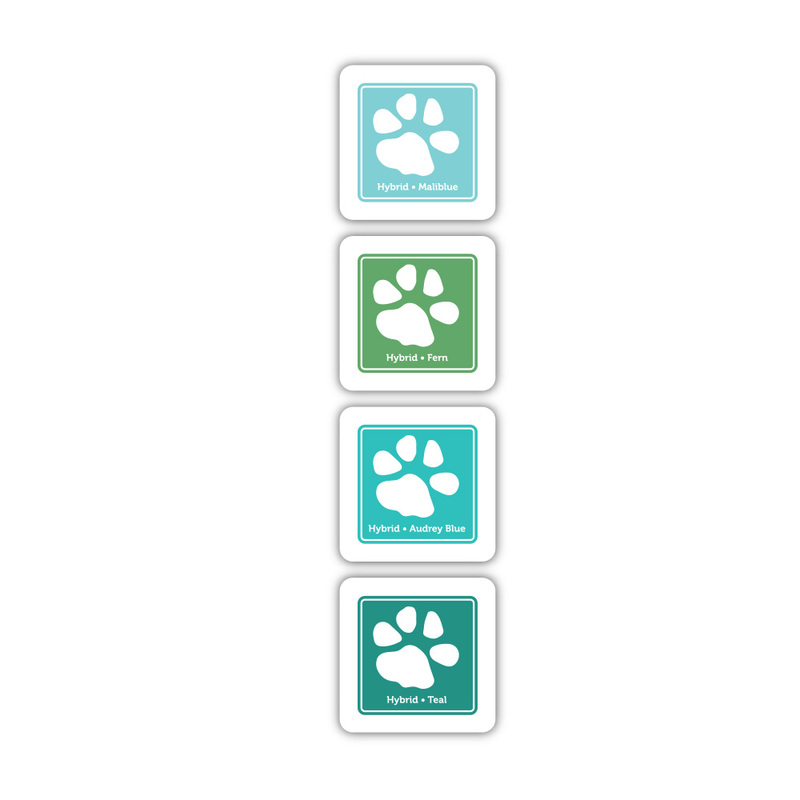 Each stop on the hop will receive a Simon Says Stamp Prize pack randomly selected by Simon on June 15. Entering is easy, just leave a comment on this post to be entered. The more stops you comment on, the more chances you have to win! The next stop on the hop is the talented Nichol Magouirk. If you've jumped in to the middle of the hop, you can start at the beginning on the Simon Says Stamp blog.